Sodicity in soil is the presence of a high proportion of sodium ions relative to other cations. As sodium salts are leached through the soil, some sodium remains bound to clay particles—displacing other cations. Soils are often considered sodic when the amount of sodium impacts soil structure. Sodicity degrades soil properties by weakening the bond between soil particles. 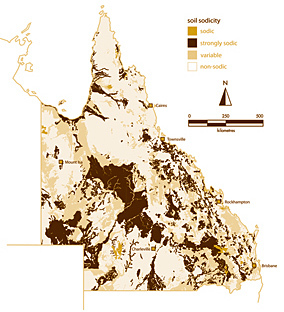 Soil sodicity is a natural feature of many Queensland soils, with approximately 45% considered sodic. dense, cloddy and structureless soils as it destroys aggregation. 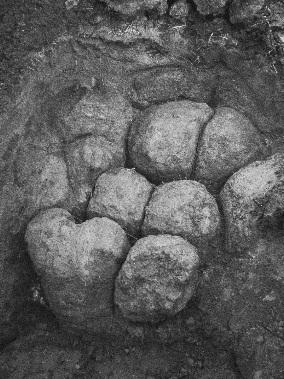 Columnar structure of the upper B horizon in a soil near Emerald, Queensland. 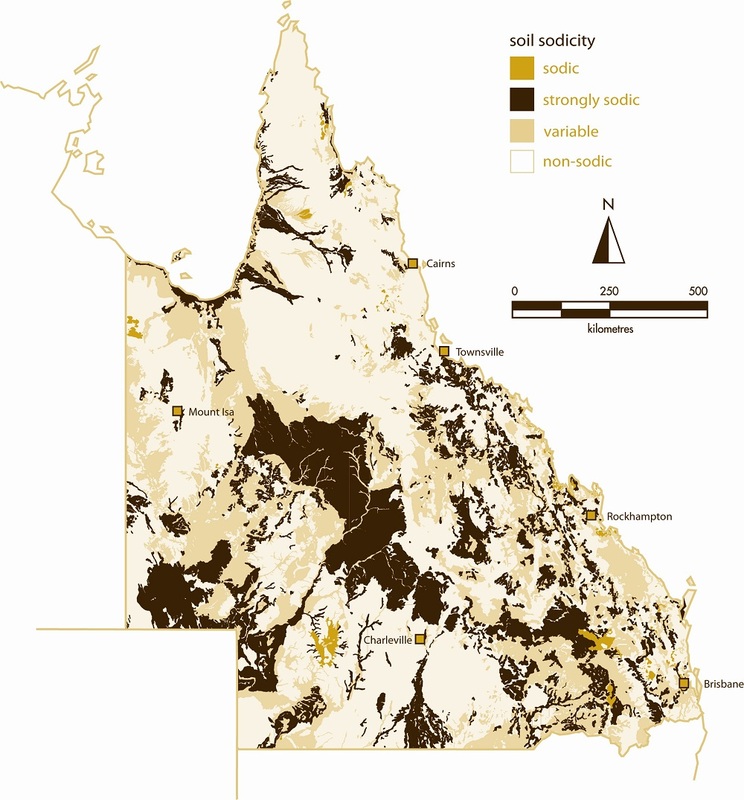 Salinity is often confused with sodicity because both are associated with sodium—a naturally occurring element in Queensland soils. Saline soils can often be sodic, but these soils will not show indicators of sodicity. The salts in the soil prevent dispersion of soil particles. Therefore soil sodicity cannot be determined by the level of sodium in the soil alone. The salinity levels also have to be measured. If this salt level falls below the requirement for soil stability even a small amount of sodium can produce adverse effects. A combination of high sodium levels and low salt will produce extremely poor physical conditions in soils. Read more about salinity and sodicity. The use of gypsum to increase the salt content is used to manage sodic soils. By raising the level of salts in the soil, this helps to suppress dispersion. There is no defined rate to apply gypsum to ameliorate a sodic soil. This has largely to do with landscape, climate and specific soil type.